My home is comfortable, clean, and spacious. 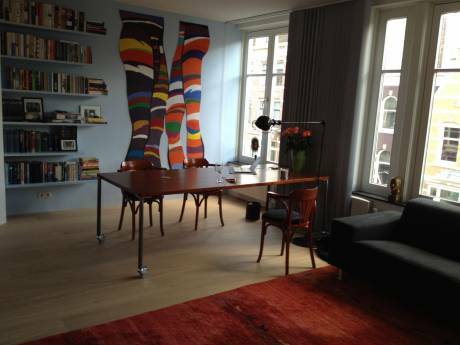 It is situated on the first floor right in the city centre of Amsterdam in a very nice neighborhood (De Pijp). It has 1 big bedroom that look out over the inner garden. A livingroom with 2 sofas, dining table, big television, hifi and a semi-seperated corner for working on the computer. There is a high speed internet connection (cable) and digital television. A seperate kitchen with oven, fridge, microwave and washing machine, you will find all the kitchen equipment you need there for you to use. There is a small bathroom with shower and toilet. At the fourth floor there is an attic where 2 people can sleep (or 3 if nececery, there is also a sleeping-couch) if you want to have visitors. There you find also the sunbed. 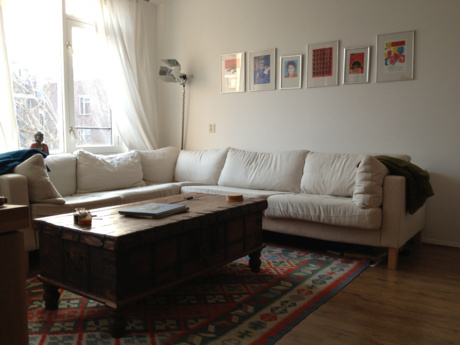 Situated in the city centre area of Amsterdam (De Pijp), next to a nice park where you can have a picnic or work-out. There are a lot of nice bars and restaurants in the street where a lot of young locals come every day. From monday till saturday there is a market nextdoor (Albert Cuijp) where you can buy fresh fish, fruit, vegtables and all kinds of nice stuff. Very close to Heineken Experience and Heineken Square, the place to be for restaurants and bars. Of course there is a lot of entertainment in Amsterdam day and night. Museums, party's, concerts, the canals and canalcruises, redlight district and shopping, etc. You can reach every part of Amsterdam by bike and I will leave my bike for you to use during your stay in my apartment. I have very nice neighbours, two of them are my cousins, who can help you with whatever cuestion you might have. I am Celina (26) and I work as a freelance grapic designer. You can see my company website at the Homepage. I started to work for myself in january 2006 and I realy love my work. I love to travel but I have to be realistic, you can not go on vacations all the time, so I thougt that this can be a very good way to be away and be able to work at the same time. Except the fact that I am very much in love with Barcelona, I would like to live there for a while to obtain inspiration and experience that can be usefull for my work. The idea is to work from Barcelona as I do here in Holland with my Dutch clients but also work as an intern at a magazine in Barcelona for some hours and get inspired by the creative ambiance of Barcelona. I need to bring my computer and printer and also my 2 lovely cats (Misty and Tess). I am a very responceble person, I speak Spanish very well. I will treat your house with a lot of respect as if it were mine.